A MOVABLE FEAST is the best way to describe a gourmet dinner which begins at one of Fish Creek’s historic inns, then moves on to a second for the main course and dessert. 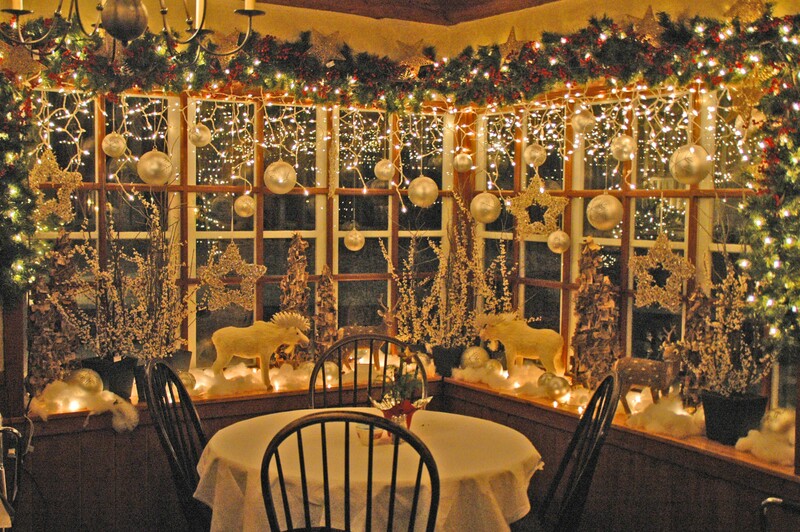 The Progressive Holiday Dinner Weekends are hosted by the White Gull Inn and Thorp House Inn. Door County Lighthouse Inn has been invited to participate on two of the weekends. We are scheduled for the weekends of Friday and Saturday, December 7 & 8, and January 4 & 5, 2013. The Thorp House and White Gull are planning memorable weekend packages, culminating Saturday evening in a five course dinner complete with wine and live music, as you tour the inns, both bedecked festively for the holiday season. THE DINNER begins at 5:30 pm, with hors d’oeuvres at the charming Thorp House Inn, built in 1902 by Freeman Thorp, of the founding family of Fish Creek. Innkeeper Melanie Camp and her staff will be on hand to relate the history of the Thorp House, and serve the appetizers. DINNER GUESTS will then be transported on to the White Gull Inn by horse drawn wagon past the many homes and businesses decorated for the holidays. The 116-year-old White Gull is the oldest continuing operating inn in Door County, and has received national critical acclaim for both its historic accommodations and award-winning restaurant. Innkeepers Andy and Jan Coulson and their staff will conduct tours and discuss the inn’s history before serving the soup, main course, salad and dessert. As always, the White Gull and Thorp House will have rooms open for viewing, and live music will be featured at each stop along the way. THE PROGRESSIVE Dinners are open to weekend guests of either the White Gull or Thorp House Inn. Door County Lighthouse Inn will be joining two of the weekend at this time. Door County Lighthouse Inn’s package include two nights lodging, the Progressive Dinner on Saturday evening, a complimentary wine and cheese reception Friday afternoon, full breakfast each morning, and complimentary hot cider and pretzels Saturday afternoon. The package price is the regular rate of the room or cottage plus $107/person. Two night minimum. Thank you for all of the wonderful fbcdeaek on this promotion. We do not offer extensions out of respect for everyone who participated in the event, however we do plan on running promotions in the future! Look for our newsletter the first week of each month for upcoming announcements and events. We’ll keep this promotion up for all of the memories – and as a reference for your comments & concerns!